Tadhg Ryan joined Galway United ahead of the 2018 season. WHETHER YOU’RE 13 or 30, playing football competitively is as much about dealing with the setbacks as it is to do with basking in glory. Even world-class players such as Harry Kane — let go by Arsenal as a youngster because he was “too chubby” — are familiar with the darker side of sport. 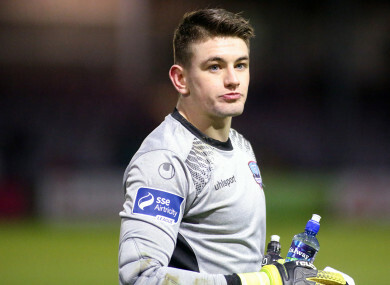 Galway United goalkeeper Tadhg Ryan is no exception to this rule. After nearly four years at Huddersfield, he left the Premier League club to sign for the League of Ireland First Division side at the start of the 2018 campaign. “I’d always say [to youngsters] look at the bigger picture,” he tells The42. “I’m a late developer, I always was. I remember when I was 13 when they named the squad for [prestigious underage tournament] the Kennedy Cup, I wasn’t picked, I remember bawling my eyes out. But for a young player wanting to do well, be disciplined, work hard and do whatever you can. And be confident, believe in yourself. I know it’s all these clichés that you’d say, but that is what it is. It’s clear hard work does beat talent, and just don’t lose any faith. Keep believing and keep going. “What separates the best from everyone else is how you react from bad situations and everything like that. I had some bad injuries at Huddersfield, but I’ve worked hard and come back stronger. Having represented Huddersfield at U18, U21 and U23 level, the lure of senior football and the chance to be a club’s number one proved impossible to turn down, with the move to Galway confirmed back in January. Since then, barring a couple of recent games out with a quad injury, Ryan has firmly established himself as the team’s number one. Results, he concedes, have been far from perfect. Touted as possible title contenders at the beginning of the season, a six-game winless run has seen the club slip to sixth in the table. The Tribesmen will be expected to reverse that trend tonight, as they host an Athlone team who have picked up just two points from 18 matches so far. With nine games to play, they find themselves 12 points behind leaders UCD. A title triumph seems highly unlikely, but fourth or higher will render the club eligible for a series of play-offs, with another Premier Division spot up for grabs. Ryan therefore believes the side’s goal of promotion is still achievable. It would be an impressive way to end a turbulent campaign. Recently, the youngster was sorry to see Shane Keegan, the man responsible for bringing him to the club, depart. Earlier this week, Alan Murphy, the Galway’s all-time record goalscorer, was confirmed as the new manager. Murphy’s appointment is not the only major change at the club. Last month, it was announced that the owners had voted in favour of Saudi Arabian investment. “The whole city, when it was all over the news, that the Saudi investment was about to happen, it caught a lot of people’s attention,” he says. “But as players, we can only focus on what’s happening on the pitch and that’s what we’re doing. We’re just focusing on what we have to do, that’s all that’s in our minds at the minute. Ryan is consequently hopeful this significant change at the top can help bring back the good times to Galway. “When you look at their past record, past successes and the FAI Cup [which they won in 1991], years ago, when Terryland Park was a fortress, in a sense. “The club belongs in the Premier Division and it needs to be competing for trophies as well. At 21, Ryan still has plenty of time on his side as he bids to get himself playing at as high a level as possible. It has already been an intriguing journey for the player, who grew up in Cappamore, County Limerick. My brothers kind of got me into football, when I was six or seven,” he recalls. “They brought me outside and put me in between two sticks as well and started belting the ball as hard as they could at me. They just wanted someone to kick the ball at and obviously, it paid off. “My family, I owe an awful lot to them for what they did to me in my upbringing and everything. It kept me in good stead for football as well, it kept me level-headed, I had a good work ethic, which is down to them. Ryan subsequently grew to love the game playing with local side Cappamore Celtic. “I played a few games outfield with them, but I was always a goalie from a young age, diving around the place, cleaning yourself, trying to stop the ball going into the net, that’s what I enjoyed the most,” he remembers. “I played outfield in GAA in hurling and football and enjoyed that, but soccer was the most enjoyable and natural as well. The youngster’s impressive performances led to him training with Limerick U19s. They went on a pre-season tour of England and came up against Huddersfield Town. Their opponents’ goalkeeping coach at the time was former Ireland international Nick Colgan, who was sufficiently impressed with Ryan’s display to recommend him for a trial. Before he knew it, the talented teenager was on the books at the club and living over in England. “When you go over at 16, you need a bit of time to adapt,” he explains. “I think I got over that pretty quickly. Obviously, the first couple of months I was buzzing, but after that, you settled in, you miss friends and family, but I got over it quick because I always had a clear picture of what I wanted to do. I just loved playing football every day. “Nick Colgan was huge in helping me settle in. There were also a couple of Irish lads over there. In terms of the experience, I learnt an awful lot. I think it’s put me in good stead for the rest of my career in terms of life skills as well. It’s very competitive over there and it was an experience that I really enjoyed and I’m glad that it happened. In a recent interview with The42, former Aston Villa youngster and current Sligo player Mikey Drennan spoke of what he perceived as inadequate support for Irish players in England. The boredom of the many hours left to fill after training contributed to his descent into depression and concurrent battle with gambling addiction. While acknowledging the scope for trouble, Ryan says he was able to avoid these pitfalls. “I used to go to the gym after training, I’d usually be the last one out the door. It’s better than going back to your digs or going back to your flat and doing nothing. You might as well put a bit of work in. While at Huddersfield, Ryan encountered one of the football’s most highly rated young managers, David Wagner, as well as a number of talented first-team players. “I trained with the first team an awful lot over there every week, but obviously [David Wagner is] after making a huge impact, getting promotion and everything. His methods are excellent. “That was a good experience — different managers’ methods and ways of training and everything. He’s obviously done an unbelievable job so far. “One thing when David Wagner came in at Huddersfield, he was very keen on his goalkeepers being able to play out from the back. It’s something we always worked on. “Goalkeepers should [work on it], because you’re on a level to outfield players now. So we did work a lot on just being comfortable on the ball — that composure to be able to receive and everything. You look at some of the best goalkeepers in the world like Manuel Neuer, you see how much of the game they have to be involved in and how good they have to be not only with their hands, but their feet as well. “The biggest thing that I’ve kept with me was [advice] from Nick Colgan. He taught me how, when you’re training, you’re training with a good intensity, you’re sharp. He continues: “There were a few [very talented players at Huddersfield] to be fair. Aaron Mooy, the central midfielder there, he was top class in training. Yet ultimately, for Ryan, it was a straightforward enough decision to come home, away from the glamour of life at a Premier League club. As a bonus to the main incentive of first-team football, his family and friends in Limerick are now just over an hour away on the motorway from where he is living. “To be number one at Galway, it sounds good and it’ll do me good, I think. It’s matured me more as well and given me good experience. Email “'I was 13 when they named the squad for the Kennedy Cup. I wasn't picked - I remember bawling my eyes out'”. Feedback on “'I was 13 when they named the squad for the Kennedy Cup. I wasn't picked - I remember bawling my eyes out'”.